Bologna is a historical city in Italy that has about 380,000 residents. It's a popular place to visit among Italians, but attracts far fewer international travelers. It is known for having the oldest university in the western world. Because of this, there's a large student population, a fun environment, and an active nightlife. Bologna is also famous for its delicious cuisine and it's impressive historic center. The city is a fun and interesting place to visit. 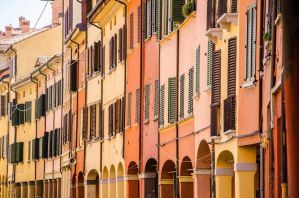 There are some good hostels around town and whether you're a student studying abroad or a backpacker looking to get off the beaten path, Bologna is a fun and fascinating place to spend some time. How much do hostels in Bologna cost? We_Bologna is a hostel that is conveniently located near both the train station and the middle of town. It's about a ten minute walk to the train station and 25 minutes to Piazza Maggiore. There's also a bus stop very close to the building. This is a traditional hostel with a social setting, dorms, and several common areas where guests can hang out. There's a shared kitchen which guests can use as well as a television room and a large garden where they host various events during the summer months. There are often live concerts, djs, or art exhibits on display here. The staff also organize any number of activities for guests throughout the year. These include game nights and food nights. The hostel has many of the standard amenities including a nice breakfast that offers bread, jam, salty pate, cereal, fruit, juice, coffee, and tea. Most ingredients are local and organic. Other amenities include air conditioning, security lockers, luggage storage, free wi-fi, free walking tours, bike rentals, board games, a foosball table, and a book exchange. Private rooms are either twins or four bed family rooms. Dorms sleep up to four people and both female only and co-ed rooms are available. A good option for solo travellers and couples. Cristina Rossi is a bed and breakfast, so it does not have the atmosphere of a traditional hostel, but it is a cozy and comfortable place to stay. What it lacks in space, it makes up for in charm and character. The house is decorated with charming antiques and you feel like you've stepped back in time. There are comfortable sofas and a beautiful antique, hand painted fireplace. There are also modern conveniences including satellite television, an elevator, air conditioning, wi-fi, and a fax machine which guests can use. The bed and breakfast is split between two levels, with the family residing on the first floor and the guests sleeping on the second floor. You're assured plenty of privacy and the hosts are very helpful and inviting. You'll quickly feel right at home here. Single and double rooms are available. Each room has an ensuite bathroom that is small but clean. Although this bed and breakfast can be a bit pricy, it is worth the money with its location, charm, and friendly owners. Riva Reno GuestHouse is another bed and breakfast that is conveniently located in the historical center of Bologna. It's close to most of the places you want to see around town and is just a ten minute walk from the railway station and Piazza Maggiore (the main square). Public transportation is readily available and provides access to the Fair District. The guesthouse is located in a historic building that has character. This is not a hostel, so it does not have the social setting you would expect at a traditional hostel, but it does offer a good value for budget travelers. There is parking available as well for an additional fee. It's about a two minute walk from the parking area to the building. This is a simple, clean and budget friendly place to stay. There is a television in every room and kitchen facilities are available to guests. Private rooms include singles, twins, and doubles. Guests can choose from rooms with private or shared bathrooms.